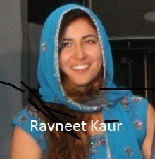 Ravneet is studying in cognitive science and will be graduated in June 2015. She did her schooling from Hemet High School. According local media, she likes to attend Stanford or U.C.-Berkeley to become a heart surgeon. She is internal policy senator for the California Community Colleges Student Senate and a member of Associated Students of Riverside City College.